A cosmopolitan, widely educated artist who kept abreast with the Parisian art scene, Hatzikyriakos-Ghika, who admired the art of Fotis Kontoglou as much as of Picasso and Braque, left his mark on the ideological and aesthetic development of the Generation of the ‘30s. He is represented in the A. G. Leventis Foundation Collection by two paintings. 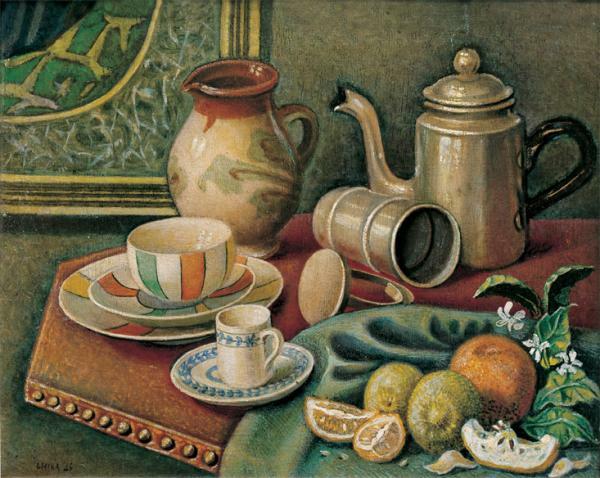 The evocative Still Life, of 1946, is rendered in warm tones and a fairly naturalistic style; contrary to other works by the artist from the same period, here there is no trace of a Cubist influence, especially of its analytical phase. Trellises and Shadows, of 1955, on the other hand, is a purely post-Cubist work, arranged in geometric shapes, a precursor of the geometric compositions of the artist’s later production from the 1960s. He studied under Konstantinos Parthenis. In 1922 he studied at the Sorbonne and concurrently at the Académie Ranson and in Dimitrios Galanis’ studio. In 1923 he began his exhibition activity in Paris, where he held his first solo exhibition in 1927. In 1928 heheld an exhibition in Athens for the first time, jointly with the sculptor Michalis Tombros. In 1934 he returned to Greece and in thefollowing years contributed to the ?? ????? ???? [The third eye] art review. In 1941 he became professor at the School of Architectureof the National Technical University in Athens, where he taught until 1958. 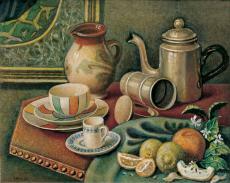 In 1946 his first retrospective was held at the BritishCouncil in Athens. In 1949 he showed his work with the ‘Armos’ group of artists, of which he was a founding member; in 1950 heparticipated in the Venice Biennale. In the meanwhile, he held solo exhibitions in various European cities and, in 1958, his cooperationwith the Iolas Gallery began, with exhibitions in New York, Paris, Geneva and Milan. In the late 1950s, he travelled to India andthe Far East. In 1973 he became a member of the Academy of Athens and held a retrospective exhibition at the National Gallery inAthens. In 1986 he became an honorary member of the Royal Academy in London and donated 45 of his works to the National Galleryin Athens. In 1992, in cooperation with the Benaki Museum, he established the Nikos Hatzikyriakos-Ghika Gallery in his homeand studio, in Kriezotou Street in central Athens, where the Museum of the Generation of the ’30s, of which he was a leading figure,has been housed since 2012. 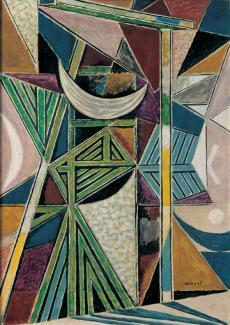 He synthesised expressions of 20th-century European painting, especially Cubism, with Greek and Oriental art modes. He alsoworked as a printmaker, book illustrator, sculptor and stage designer, and pursued theoretical issues of art and aesthetics.